It is something to walk into a space and feel infinite. Possibilities (and fitting room doors) are open and endless. It is also something to walk into a space and feel true intimacy; a feeling of priority and comfort. Luna Boutique has managed to do both. 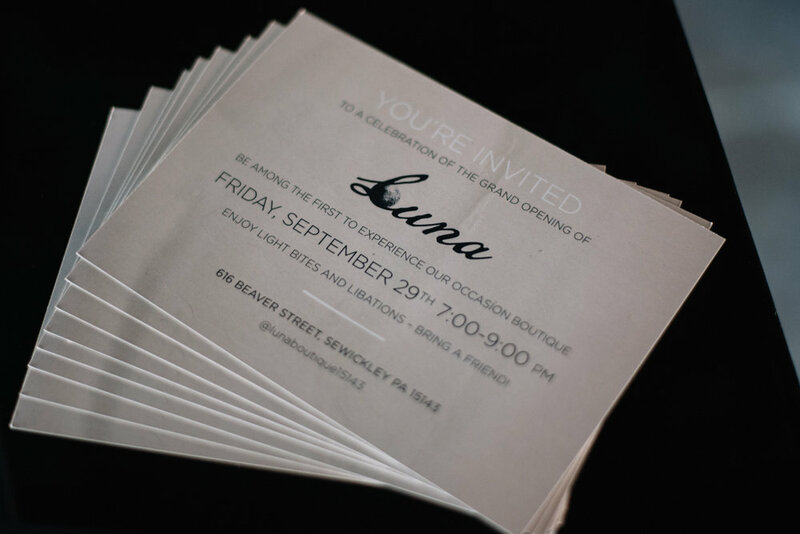 Luna Boutique, a fashion-forward cocktail, evening and wedding dress boutique, is the latest edition to Sewickley's quaint Beaver Street. It is the brain child of Erin Szymanski, owner of Glitter & Grit. If you know Erin, then you know she is a force. Strong and direct in her ideas, Erin's work ethic is a master class in entrepreneurship. Though there is a constant flurry of activity in her mind and behind her shops, she never makes it known. If I have too much on my plate, my hair is frizzier, my coffee larger, and my speech faster than my brain can keep up. Not, Erin though; her confident, calm disposition is striking and impressive. No less impressive is this vast space thoughtfully sprinkled with "pretty things." This boutique is a destination for exclusivity. 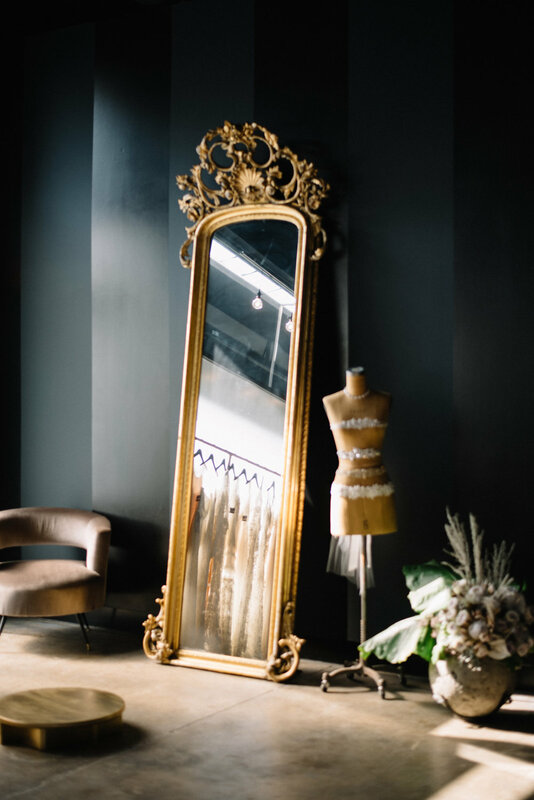 Stunning bridal options gently kissed by the light through frosted glass are to your left. Fashion forward, unique cocktail and evening wear in a rainbow assembly are to your right. Luna presents us with rare, stunning options to stun those around us. Be warned, once a dress goes, it goes. Styles are vast and unique, depth in each specific style are not. When a dress chooses you, it chooses you and no one else. Erin and company will even register your dress to ensure there is no overlaps within events. Long story made short sentence, if a dress looks and feels stunning on you, buy it. Hesitation will only lead to disappointment and drowning your sorrows in Netflix and Pumpkin-something-flavored ice cream. Take this Yumi Kim Woodstock Maxi (which I need to take my own advice and buy STAT). When a store owner looks at you and says, "I thought of you when I brought in this dress..." your heart stops and your hands clap rapidly like a cymbal monkey. Erin pulled this maxi and I instantly fast forwarded to a December wedding I am attending. I feel, well, pretty in this dress. Even the color, Lilac Passion, makes me feel pretty and calm. It tightly graces my attributes and makes room for my flaws. The dress' fluidity is humble when standing still or sitting down, then I move. Life rushes from waist to toe with each twirl. I dove into two more pieces as the morning passed. Elliatt's Aurora dress was up to bat in a color I define as "darkest before the dawn." The rope detailing on the sleeves and hemline are edgy and push it beyond the little black dress category. It is comfort and cool wrapped up into one stunner. Jumping to the other end of the color wheel, I ended my fit session with C/MEO Collective's elegant Limitless dress in a color I define as alabaster. A comfortable (non-see through!!) slip dress with pockets and a cape attached is a match made in heaven. Though I am not one to be drawn toward shorter dresses, both these pieces spoke to my edgy, oversized-fit style. "I just want to be surrounded by pretty things," said Erin. Folks, she nailed it. Her team behind her nailed it. This boutique will leave you with a sense of empowerment, beauty and tons of Instagram content (wink, wink). Sit on her blue suede couches, soak in the powerful charm and then shop your little heart out. When you have found the style that is as original as yourself, give Erin and her team a high-five. Then give them a cheers for making Pittsburgh all that more beautiful. This Friday, September 29th, from 7pm to 9pm, marks the grand opening of Luna! Join Erin and her team for the #LunaEclipse full of light bites, conversation and all the "pretty things." Cocktails will be curated by Nicole Battle and tunes provided by DJ, Jarrett Tebbets. See you at 616 Beaver Street, folks. Until then, shine bright as only a #LunaLoyal can. 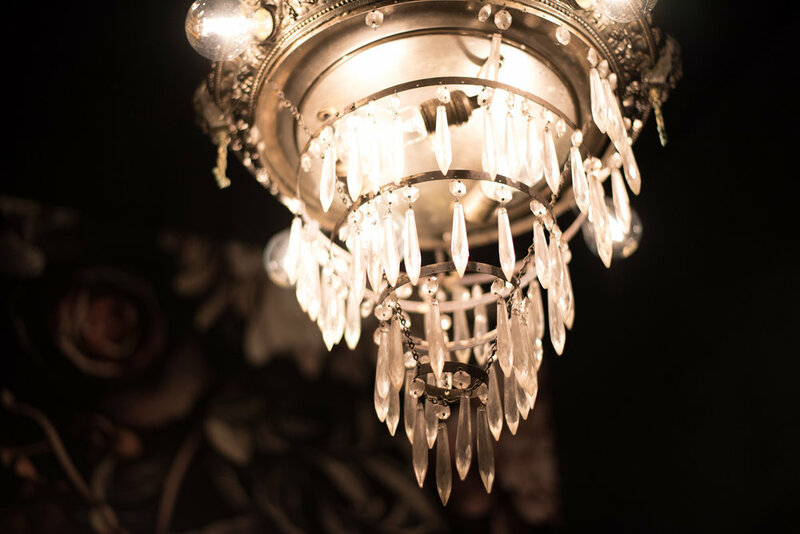 Leanne Ford Interiors designed the magical interior of Luna. All photos by Sarah of Rose Colored Creative, who captured Luna's space so beautifully. Her talents continue to take my breath away.